Beautifully filmed, follow the story of seven steam engines retracing the famous timber haulage route through the spectacular landscape from the hills to the coast. Travel with the crews a tale full of memories and anecdotes. 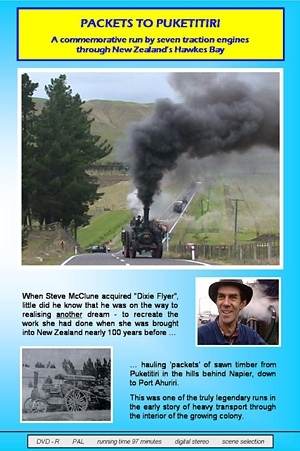 When Steve McClune acquired "Dixie Flyer", little did he know that he was on the way to realising another dream - to recreate the work she had done when she was brought into New Zealand nearly 100 years before, hauling 'packets' of sawn timber from Puketitiri in the hills behind Napier, down to Port Ahuriri. This was one of the truly legendary runs in the early story of heavy transport through the interior of the growing colony. The film follows the engines from dawn to dusk, up hill and down dale, through drizzle and rain, good moments and bad, to the final sunny ending - with an unexpected but delightful surprise en route. Even in the age of air travel few of us will have the opportunity to see Steam Preservation on the underside of the globe. Enjoy steam and enjoy… New Zealand !